Posted on June 28, 2017 , in Swim Spas. With summer on its way, keeping your swim spa well maintained is key to being able to use it to its maximum potential. Below you’ll learn find out how to keep your water clean and clear and your swim spa components running strong all summer long. Swim spas are often used more during summer than at any other time of the year, which makes it especially important to keep your water balanced. When it’s very warm outside, you should check the water balance at least 3 times a week and make sure to adjust the chemicals as soon as you notice any issues. When temperatures become cooler, you can drop down to checking the water balance once per week. It’s also essential to have chemicals readily available for when you need to adjust them. Make sure to have everything you need on hand! Debris including lint, hair, leaves, and more can clog your skimmer basket and filter. If this becomes a serious problem, it can even cause your swim spa’s components to malfunction. The first thing you can do is remove any surface debris with a skimmer as soon as you notice it. Using your cover will also prevent debris from entering the swim spa at night. Next, make sure to clean your skimmer baskets at least once a week. If you use your swim spa more frequently, you should also check your skimmer baskets more often. You should also clean your filter once each week, removing any debris. Remember that even if you haven’t been using your swim spa more than usual, summer storms can increase the debris that accumulates in your swim spa. During stormy weeks, you should still check your filter and skimmer baskets. Something many people forget to monitor is the level of water in their hot tub, but when water levels get too low, it can result in damage to the internal components of your swim spa. Whenever the water level starts to get low, add water and make sure the adjust your chemicals. Keeping water and chemicals in check will keep your water balanced. 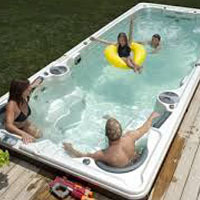 The professionals at your swim spa dealer can be of great help to you. Whether you don’t have time to maintain your swim spa, have a water balance issue, or want to know how to better maintain it, a professional can help. Most dealers have maintenance packages you can buy to help you stay on top of maintenance. If you truly want to make maintenance easier, investing in a self-cleaning swim spa is a great idea that will give you a lot more free time. A self-cleaning swim spa will filter, skim, vacuum, and clean for you so you can spend your time enjoying your swim spa rather than maintaining it. These tips should help you keep your swim spa in great condition this summer. To find out more about the best swim spas for your lifestyle, download our buyer’s guide.